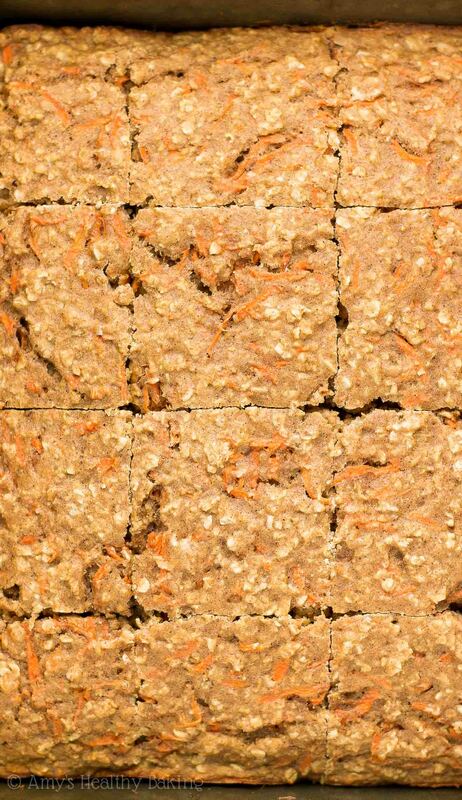 An easy recipe for tender oatmeal snack cake full of sweet carrots & cozy spices. It truly tastes like the iconic dessert—for just 100 calories! I made my first carrot cake from scratch during my senior year of high school for our Easter lunch. After looking through my family’s cookbook collection and comparing each of the recipes inside, I finally settled on the one from my personal favorite cookbook. I carefully measured flour and spices, creamed butter and sugar, and gently folded freshly grated carrots into the batter. After spreading it into the large sheet pan (and licking the beaters for a taste test! ), I popped it into the oven and set a timer. Later, once the cake had fully cooled, I beat softened cream cheese and powdered sugar, along with a bit of vanilla, until I had a bowl of sweet and creamy frosting. I spread it on top of the sheet cake, then stepped back to look at my handiwork. My whole family admired the cake… And nearly considered skipping the honey-baked ham and side dishes! With just six of us at our Easter dinner—the four of us, plus Mom’s cousin and her significant other—we ended up with plenty of leftover cake. With school out for Spring Break, my brother and I wandered into the kitchen multiple times over the next day to carve off a small slice for a snack… So the sheet pan was completely empty in less than two days! 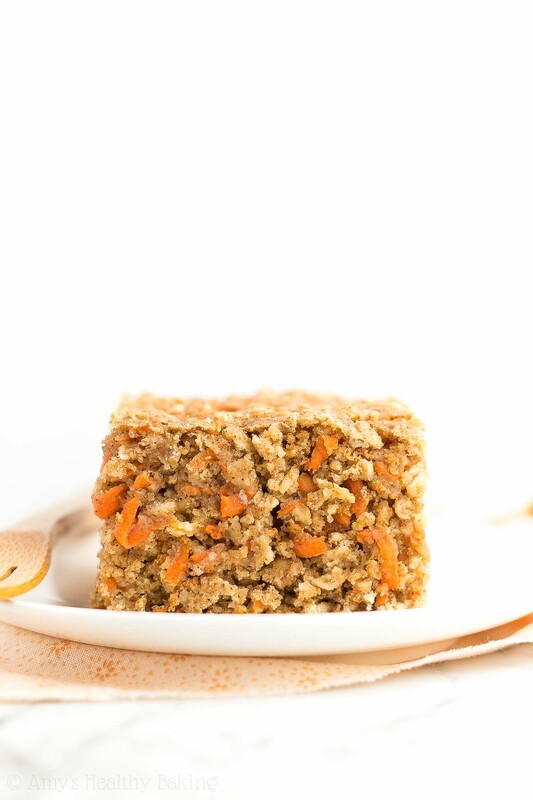 But because traditional carrot cake recipes don’t exactly make for the healthiest snacks… I planned ahead this year and created this delicious recipe for a Healthy Carrot Cake Oatmeal Snack Cake! 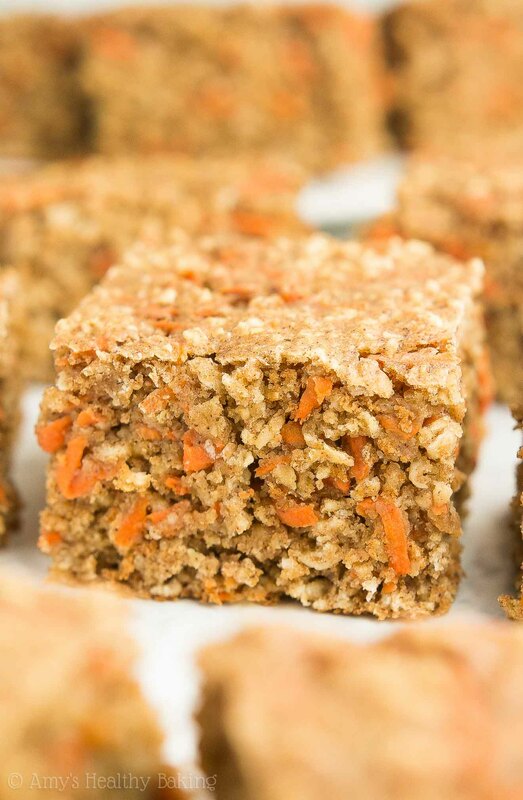 It has the same flavors as regular carrot cakes, like lots of cozy spices and sweet carrots, along with plenty of hearty oats, and it’s really easy to make. 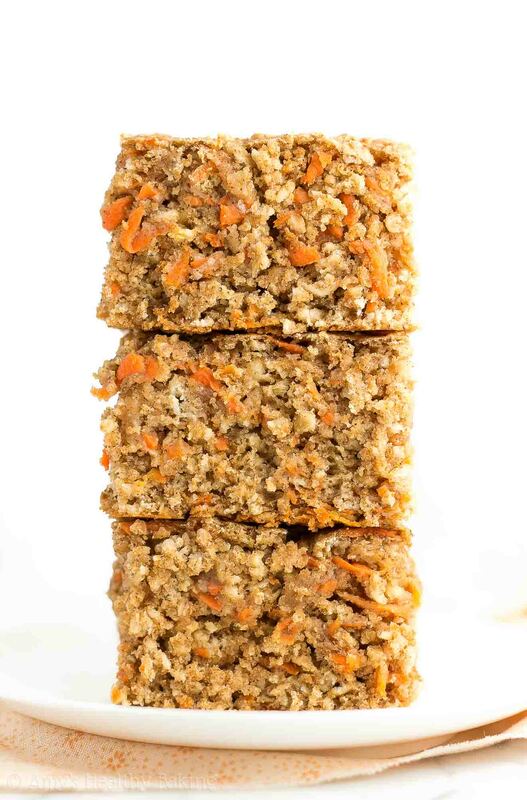 Yet this healthy snack cake is just 100 calories—and it’s totally acceptable to eat for breakfast, too! That’s the best kind of carrot cake, don’t you think?? 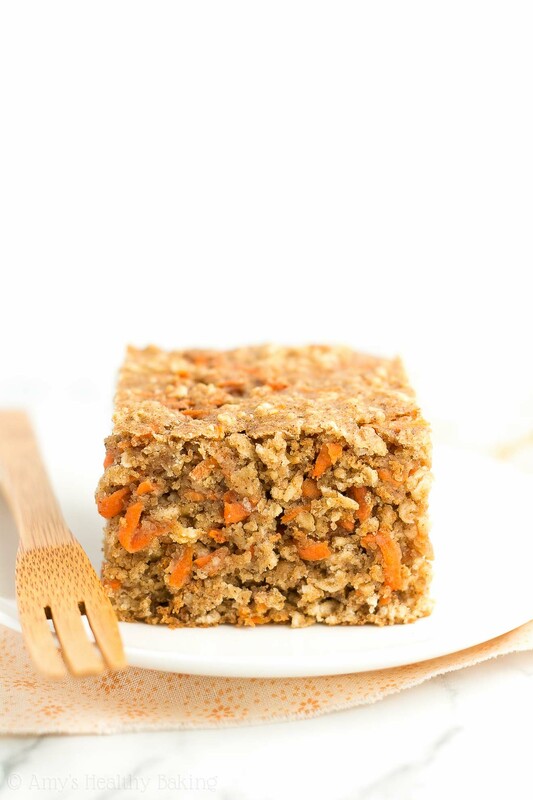 Let’s quickly talk about how to make this healthy carrot cake oatmeal snack cake! To start, you’ll need whole wheat flour (or gluten-free, if you prefer!) and instant oats (like this… or this for a gluten-free version!) Instant oats are also called “quick-cooking” or “one-minute” oats, and you can find them right next to the old-fashioned oats at the grocery store. It’s extremely important that you measure the flour and oats correctly, using this method or a kitchen scale. (← That’s the kitchen scale I own and love!) Too much of either ingredient will dry out your cake batter, especially the oats. They act like little sponges and soak up as much moisture as they can! My favorite part of carrot cake isn’t actually the carrots… And it’s definitely not the frosting! (I’m actually not a big frosting fan in general, surprisingly enough!) Instead, my favorite part is the spices! You’ll need cinnamon (I’m currently obsessed with this one!) and nutmeg. The nutmeg makes a big difference and creates an added depth and richness, so don’t skip it! 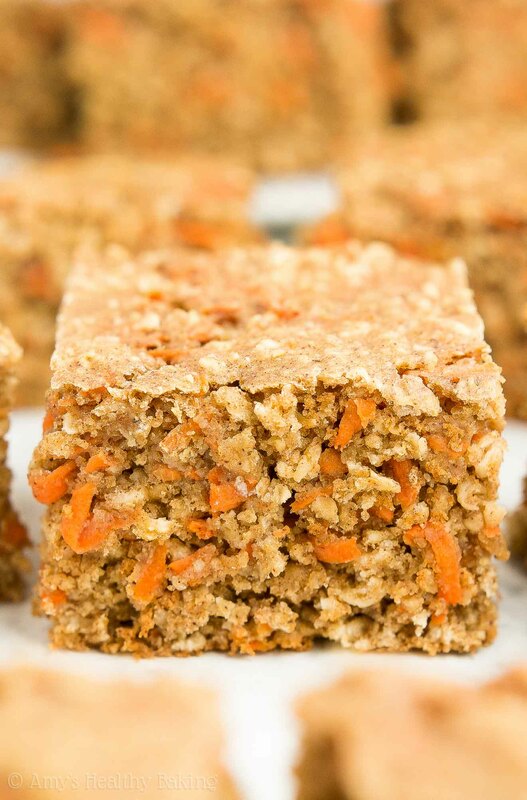 Unlike traditional recipes, this healthy carrot snack cake only requires a mere ½ tablespoon of butter or oil. Yes, that’s it! Greek yogurt provides the rest of the incredibly tender texture. It adds the same moisture to your batter as extra butter or oil, and it gives your healthy snack cake a big protein boost, too! You’ll also skip the refined sugar and sweeten your easy snack cake with pure maple syrup (like this!). Skip the pancake syrup or sugar-free syrup! You want the kind that comes directly from maple trees. It has the best flavor and creates the best texture! And now it’s time to fold in the carrots! Make sure you use freshly grated carrots, not the store-bought pre-shredded ones. The latter are thicker and tougher, and they don’t soften enough while baking. I promise it’s worth the extra effort of grating your own! Morning snack… Afternoon snack… Bedtime snack… Maybe even breakfast… I may or may not have eaten this healthy snack cake for all of the above! ? And when I shared some with my dad, he gave it two thumbs up—truly high praise! ???? And when you make your own, remember to snap a picture and share it on Instagram using #amyshealthybaking and tagging @amyshealthybaking IN the photo itself! (That guarantees I’ll see your picture! ?) I’d love to see your snack cake! 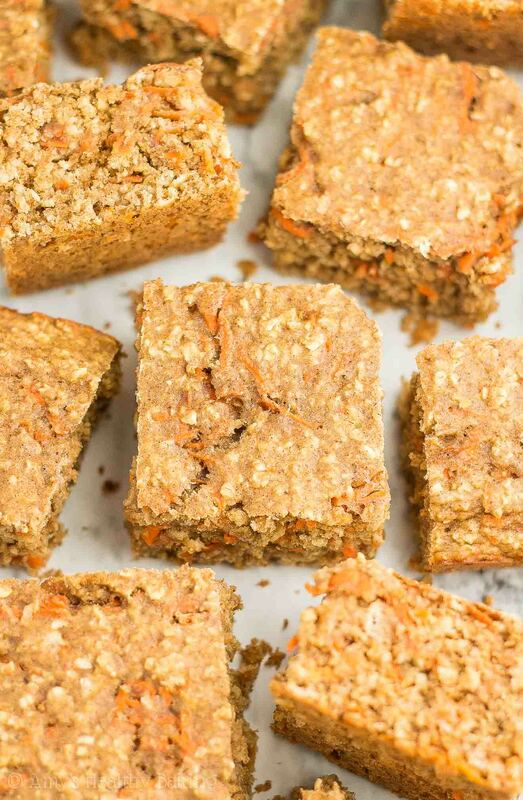 This healthy snack cake has all of the same irresistible components as traditional carrot cake--cozy spices, sweet carrots, and a comforting texture--but it's much easier to make! (And it's secretly healthy enough for breakfast, too!) Leftovers will keep for at least one week if stored in an airtight container in the refrigerator. In a medium bowl, whisk together the oats, flour, baking powder, baking soda, cinnamon, nutmeg, and salt. In a separate bowl, whisk together the coconut oil, egg whites, and vanilla. Add in Greek yogurt, stirring until no large lumps of yogurt remain. Stir in the maple syrup. Alternate between adding the oat mixture and milk, beginning and ending with the oat mixture, and stirring just until incorporated. (For best results, add the oat mixture in 3 equal parts.) Gently stir in the carrots. For the gluten-free flour, I recommend the following blend: ¾ cup (90g) millet flour, ¼ cup (30g) tapioca flour, ¼ cup (30g) brown rice flour, and ½ teaspoon xanthan gum. Most store-bought gluten-free flour blends (like this one!) will work as well, if measured like this. It’s extremely important to measure the flour and oats correctly, using this method or a kitchen scale. (← That’s the one I own and love!) Too much of either will dry out your cake and give it a crumbly texture—especially the oats! They act like little sponges and soak up moisture from your cake batter. I tried the recipe as is and it is delicious! But I was also missing some of the traditional bites in carrot cake. Will this recipe still work if I ate walnuts and raisins? Would I need to add more liquid? I’m so glad you enjoyed this snack cake Jennifer! I actually don’t like nuts in my carrot cake, which is why this recipe doesn’t include any. 😉 You’re welcome to add in both walnuts and raisins, if you prefer! I recommend hydrating the raisins first though. To do so, add them to a microwave-safe bowl, and cover them with water. Place a lid or piece of plastic wrap, and microwave on high for 1 minute. If you do this at the very beginning of the recipe, before you’ve measured or mixed together any of the other ingredients, and let them sit until you’re ready to fold them in at the end of Step 2, then they’ll be really plump and juicy! 🙂 I can’t wait to hear what you think of that little modification! Quick query re the eggs – do you use the egg yolks out for a technical or nutritional reason? I really appreciate your interest in my recipe Sophie! I omit them more for nutritional reasons. Some of my family members have high cholesterol, so by omitting the egg yolks, they’re able to enjoy more of my recipes. If you’d like to use 2 whole eggs in this particular recipe, that’s fine! 🙂 I’d love to hear what you think if you try this snack cake!